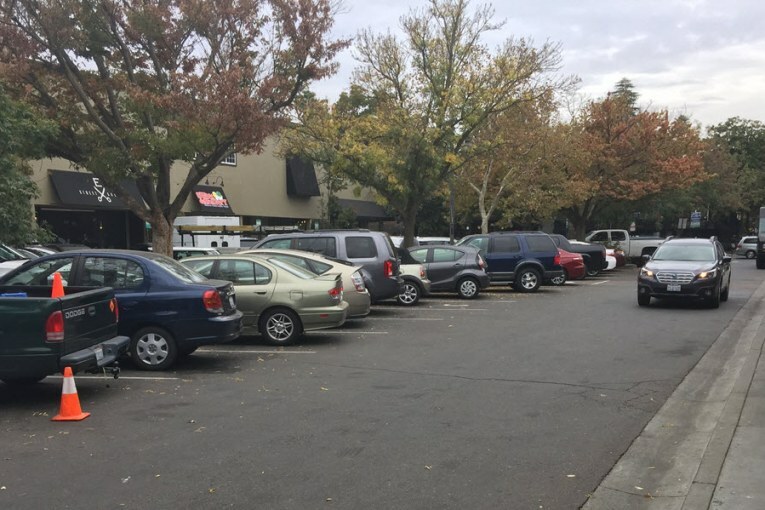 It turned out that none of the four members of the Davis City Council were ready to add paid parking on the streets, and so they created a compromise on Monday that added paid parking for four surface lots but no streets – plus some other changes they hope will alleviate peak hour congestion – and stopped short of the move opposed by what seemed to be the vast majority of not only businesses but also the community. Following an hour or so of public comment, the councilmembers each laid out their thoughts and then methodically put together a motion that included some major moves and some minor ones, leading to a 4-0 vote with Councilmember Will Arnold not present due to a self-declared conflict. The proposal was to add paid parking to four parking lots: E Street Plaza (which currently has paid parking), Amtrak Train Depot, North F Street Lot, and the South G Lot. The enforcement time would run until 7 pm – rather than the proposed 10 am to 10 pm that staff and consultants had originally recommended. There would also be no Sunday enforcement – which was a big complaint by both the community and businesses. For the Amtrak lot, staff will explore providing discounts for Yolo County residents. There will be additional language that revenue funds will be used in the downtown. They will look into adding X-permit parking in various locations, look into the appropriate number of 20-minute spots available in the downtown (Lucas Frerichs suggested that there were perhaps too many of them, which could free up some additional regular parking spots on the street), move Jump Bike and Zipcar spots as needed, and also work with the Davis Chamber and Davis Downtown to convince employees not to park on surface streets. In addition, Brett Lee added language that they would not be adding on-street paid parking at this time. The crafting of the motion followed about an hour of council comment in which each councilmember laid out their general and specific comments on paid parking. He said it’s one thing to not want the meters, “but there are a number of folks who have said the creation of paid parking in downtown Davis will destroy it. Paid parking has been in downtown Davis for 11 years at this point. The E Street Plaza is full pretty much every day. People are willing to pay at that lot – they do. “The notion that paid parking is going to destroy the downtown is I think a bit much,” he said. He said, “The analyst in me thinks that the approach that city staff and the consultants brought to us is a very good start to think about. With that, the council was ready to move forward on a middle course – adding paid parking to some lots and attempting to better manage the current supply, recognizing that they lack the resources to add a major new lot. The addition of these lots is how many spaces? The result will likely be more congestion of on street parking. Did the CC give up their own exemption placards? So much for the argument that if you don’t want to pay you should walk further. Laugh out loud! The previous council tried to do so in 2015 by voting to put meters in front of Davis Ace but failed. If they went to on-street paid parking, would have preferred ‘block-face’ kiosks, rather than more meters… visual, physical ‘clutter’, more maintenance of equipment, etc. go against meter near each space. There will be additional language that revenue funds will be used in the downtown. The only valid reason for adding paid parking downtown is to better manage the availability of on-street parking so as to minimize the impact of drivers circling to find a spot near their destination. In that regard, this solution is not a ‘half-step,’ it is a backward step that will make the problem worse. In my opinion, this decision can only be explained as a revenue enhancement measure because it is unlikely to have any positive impact on the parking situation downtown. Agreed, this will make things worse and the city will actually lose money because they will hire a parking manager and two enforcers while generating less than half the projected revenue. Maybe they will make up the difference on the parking tickets. Of course, down the road, the solution from the city will be more meters. This is the head of the camel now inside of the tent. If the City, in fact, hires those new employees, then we will know that the goal of this policy was to increase revenues in order to expand City staff and compensation rather than to improve parking management downtown. It’s interesting that Greenwald did not use a breathless, sensationalist headline like “The City Council Does Not Believe In Science”. The old saying about not pooping where you eat comes to mind. For the Amtrak lot, staff will explore providing discounts for Yolo County residents. It’s already discounted — it’s free. I agree, the City CAN charge at the Amtrak lot. Monthly train ticket to SF is $549, $400’s to East Bay. With every dollar asked, more train riders will choose to drive instead. There is no parking advantage here, as the Amtrak lot can’t be used during the day for downtown use, so this is only for revenue. Tread careful in pricing this lot, lest more people use I-80. It shouldn’t be higher than the cost for Amtrak parking at 4th and G garage. work with the Davis Chamber and Davis Downtown to convince employees not to park on surface streets. Laughable. It has been ‘worked’ through to ‘convince’ for 20 years. There is nothing magic about 2019 — the same failure will be experienced, but it sure sounds like someone is gonna try doesn’t it? This is just posturing. There is no try, blah blah blah. The main goal here was to reduce CIRCLING. With more paid lots, all those spaces are now less attractive, and the street parking has just been make more attractive. The result of this will be MORE CIRCLING. It’s been said half-measures avail us nothing. In this case, the council has led to a slight increase in auto use through discouraging people from taking the train, and discouraging use of parking lots, both by making people pay for them. The result is slightly more pollution and congestion. Alan – correct me if I’m wrong, but isn’t one of the longstanding complaints that Davis did not charge for the Amtrak lot while other communities do, which has led some to commute to Davis to park all day, to no benefit to the community? That was exactly what they said last night. Staff said people drive over from West Sac to use the Davis lot because of the cost of parking there compared to here. They seemed to have specific data on this issue. isn’t one of the longstanding complaints that Davis did not charge for the Amtrak lot while other communities do, which has led some to commute to Davis to park all day, to no benefit to the community? Not all stations have paid parking, Sacramento does have paid parking. It’s more complex than that. For most of the north suburbs (with I-80 cutoff) and much of Sacramento, it is easier to drive to Davis than to fight traffic and wind into the parking lots near the station, walk to the station, then walk another five minutes out to the Sacramento distant train platform. Davis is easy-peasy, with a parking charge or without.. The lot was partially paid for with state funds, with the agreement that during times the parking is needed for Amtrak patrons (commute hours), the lot would be available only for them. Everyone, including Davis residents who use the train, will be paying for parking. My understanding is that Davis can charge for parking, but can’t charge a varied scale based on place of residence. Perhaps someone can find a legal way around this; I doubt it. Anytime you raise the price for a total commute, some will choose to return to their cars. It doesn’t matter where they live. The only ‘benefit to the community’ will be parking revenue. Some people will drive, so the lot will fill up slightly later, with people who were parking at 4th and G moving to the Amtrak lot. Unless the charge is so much that it discourages so many people that there is room. In which case there would be a LOT more people driving. Is that our goal? More money for Davis, more cars on the road? One might ask that in regard to other proposals, as well. Alan, not just commute hours… a couple of times, AMTRAK gave us a parking pass to park for 3-day trips to Reno… we also brought our bikes for when we were in Reno… which, surprisingly, is a pretty ‘bike-friendly’ City… did UNR (including the ‘planetarium’), Carson River bikepath/greenbelt, etc. My understanding is that Davis can charge for parking, but can’t charge a varied scale based on place of residence. Perhaps someone can find a legal way around this; I doubt it. The legal way around this is to provide parking cost rebates to residents in the 95616 and 95618 zip codes. They can send in their parking receipts to document when they parked. The IRS says driving a vehicle has a cost of $.58/mile in 2018. A roundtrip to San Francisco during commute hours with bridge tolls would therefore be $104/day. And unlike Davis, you would have a parking fee, say $10/day. At $114/day, and 22 work days a month, the cost of driving to S.F. is $2,508/month. Now many people of course don’t think about all the repairs and things that cause that number to be so high, but the IRS isn’t in the business of letting people overcharge for mileage reimbursement. So at $549/month for an Amtrak ticket, an additional $220 for parking is still a good deal and only a fool would consider driving instead. They would need to get at least two other riders for a car pool to be competitive on a cost basis. Not such a good deal either if you are working on the computer while on board the train or even just taking it easy. No, that’s what the IRS compensates, not what it costs to drive a car. Most people don’t consider long-term costs of driving a car, just gas. So somewhere in the middle, plus many people who long-distance commute have cars that get great mileage to compensate. Also, a lot of people don’t work in downtown SF, so don’t have those parking fees. And, a lot of people park in the east bay and take BART in. So your example is a high on the high end as possible, unless you drive a Greyhound bus to work. Alan, you’re the one who quoted $549/month to San Francisco. So, I’m using the example you put forward. And just because $.58/mile is not what people pay out of their pocket every day, doesn’t mean it’s not an actual cost if you plan to drive to the Bay daily. But use $.40/mile if it makes you feel better, less than that and you’re kidding yourself. It’s still expensive. Also, if you BART back and forth to S.F. it’s another $15/day on top of your mileage and you still get to join the I-80 parade. But without getting too far down into the weeds, the point is that $10/day is not a big price to pay for the subsidized and comfortable commute by rail. If Sacramento commuters have other reasons to drive to Davis, those reasons will still be in effect and another $10/day isn’t going to matter. If you cut my estimate in half, its still $1,200/month. My proposal given the opposition to meters would be to make the parking on the blocks on 2nd and 3rd from D to G and those cross streets between 2nd and 3rd one hour instead of two hour spaces. Employees and business owners are able to manage their time to get out and move their cars every 2 hours; I don’t think they could tolerate 1 hour intervals. Customers with business that lasts more than an hour would park in the areas outside of that zone. We keep free parking, but we increase space turnover.